Bengaluru, Karnataka, India – A misty start turned into a bright morning as His Holiness the Dalai Lama drove out of Bengaluru to Tumkur University today. He was welcomed on arrival by the Vice-Chancellor and Registrar as well as the Abbot of Sera-Jey Monastic University. Resonant drummers and horn players preceded them into the Dr Sree Sree Shivakumara Maha Swamiji Auditorium. After the auspicious lighting of the lamp, invocation prayers were chanted first by a mixed group of Indian singers and then by monks from Sera-Jey. His Holiness, the Vice Chancellor, Registrar and Abbot were formally made welcome. In his introduction Vice Chancellor Prof Jayasheela remarked that everyone present was looking forward to hearing what His Holiness had to say. He reviewed the partnership that Tumkur has with Sera-Jey and mentioned projects they are co-operating on, including student exchanges and the translation of several of His Holiness’s books into Kannada. Sera-Jey Abbot Tenzin Choesang Rinpoche read a report outlining his Monastery’s relations with Tumkur University. The memoir of understanding between the two institutions first signed in 2012 was renewed this year. He listed the conferences and workshops that they have held together during the initial period of their agreement. 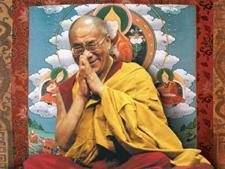 His Holiness was requested to release five books produced and published by Sera Jey Monastery. They included an account of Buddhist Tenets translated from Tibetan into English and produced as a bi-lingual edition; a record of the history and culture of the Mahayana translated from English into Tibetan; a magazine containing essays and papers translated from English into Tibetan; the Seventy Topics related to ‘Ornament for Clear Realization’ in Chinese and Notes on Avalokiteshvara translated into Chinese. His Holiness began his talk by saluting the audience as his respected brothers and sisters, young and old. “Indeed, I’m very happy to be here once more. I’m now more than 82 years old and during my time I’ve learned many things and noticed many others. Some say the ‘Big Bang’ took place 12 billion years ago, others assert it was 25 billion years ago. Whichever it was, our sun is said to have appeared about 5 billion years ago, after which life appeared in our solar system and in due course human beings evolved. “Human beings developed language. Our brains are something quite special, they give us the ability to change and develop in ways that other mammals are unable to do. However, this power also involves a capacity for wanton destruction. We may think of powerful predatory animals like lions and tigers as aggressive and violent, but I was once surprised to learn how peaceful they can be. If they are well fed, they have no drive to hunt and kill. “Human beings, on the other hand, are intelligent, but if their intelligence is controlled by disturbing emotions, they have the potential make a great deal of trouble. Does this mean that human nature is good or bad? Scientists say the evidence is that human nature is essentially compassionate. Experience shows that by using our intelligence we can nurture this seed and extend it to become infinite compassion. “We can also use our intelligence to distinguish which of our emotions are disturbing and which are constructive. Scientists have observed that constant fear and anger, for example, have the effect of undermining our immune system, whereas having a warm heart and peace of mind are good for our physical health. This is why we need to adopt a code of emotional hygiene. 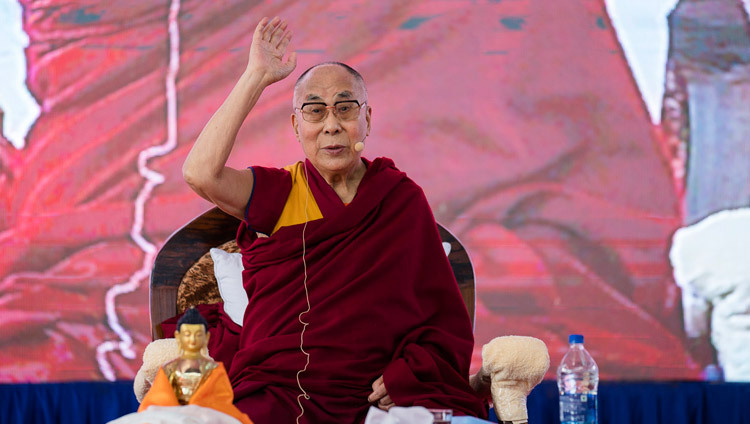 His Holiness explained that religious traditions have customarily carried a message of tolerance and forgiveness, but today the education system is more influential. Unfortunately, although modern education is highly developed in terms of the knowledge it conveys, it fails to produce a healthy, happy society because of its lack of attention to inner values and peace of mind. There is a need for it to become more holistic and impart universal values. His Holiness observed that suffering is rife in different parts of the world with innocent people being killed and children dying of starvation. He lamented that if things go on in this way, the 21st century will be no different from the violent century that preceded it. He noted no slackening in the manufacture and acquisition of powerful weapons, whose only use is violent. “We are now more interdependent than ever before. We also face common challenges like the threat of climate change. We have to take others’ interests into account. In this country, the world’s most populous democracy, there are a multitude of different languages and cultures in different places and yet they all belong to the union that is India. I have great admiration for the spirit of the European Union. After the Second World War historic adversaries decided to put their common interest ahead of narrower local concerns. “Our education system should take an unbiased secular attitude and include instructions about the advantages of love and warm-heartedness. In India there is a longstanding tradition of ahimsa, non-violence, which is rooted in karuna or compassionate thought. However, in today’s India there is a strong inclination to look to the West, which is oriented towards a materialistic outlook. There is an urgent need to combine modern education with the ancient Indian understanding of the workings of the mind and emotions and the use of logic. Only India has the potential to be able to do this. This is a project that Tumkur University and Sera-Jey Monastic University could profitably explore together. Many of the young students had questions for His Holiness. One wanted to know about the status of Buddhism in China and he told her that historically China has been a Buddhist country. He observed that wherever Chinese have settled in the world they set up ‘China Town’, where there is almost always a Buddhist temple. He added that, familiar with the works of Nagarjuna, the Chinese also follow the Nalanda Tradition. During the Cultural Revolution there was widespread destruction in relation to all religion, but there has since been a recovery. President Xi Jinping has stated publicly that Buddhism occupies an important place in Chinese culture. Research suggests there are now more than 300 million Buddhists in China, many of them well-educated people. Another young student asked about wisdom and His Holiness told her it concerned the ability to understand reality. It involves knowledge at a deeper rather than a superficial level based on the observation that appearances do not reflect reality. The Tumkur Registrar concluded the meeting by expressing gratitude to His Holiness for coming and speaking at the University once more. Lunch was provided in the Guest House that commemorates Madan Mohan Malviya the freedom fighter, contemporary and companion to Gandhi and founder of the Banaras Hindu University. Following that, His Holiness returned to Bengaluru. Tomorrow morning he will travel to Delhi.